Microsoft’s infamous “tilt into the death spiral” humour is not so funny. Rather than build superior products it is trying to destroy rivals and eliminate choice in the market, not only to reduce real choice. Today’s new discussion is based on VMware, which was covered extensively in the past two days’ news. “Therein you have many of the characteristic of what Microsoft refers to as “The Slog”, which is beyond just “guerrilla marketing”.”We have already documented some examples of Microsoft tactics for countering competition. Familiar patterns include dumping, shared monopoly alliances, financial games, targeted brain drains, and aggressive/hostile acquisitions. That last pattern happens to be a warning about Microsoft’s attempts to scoop up or attack the competitors one by one. A previous post showed some new example of cases where Microsoft executives influence Microsoft's potential rivals, which no longer are. They are likely to become more obedient due to the inter-personal issues at play (bearing in mind that companies are just people and — accordingly — their behaviour is a personal thing too). Some of the latest maneuvers against VMware are being played while insulting the competition using paid allies, e.g. Yankee Group [1, 2], and having partners make a lot of noise over yet-inexistent Microsoft technology. 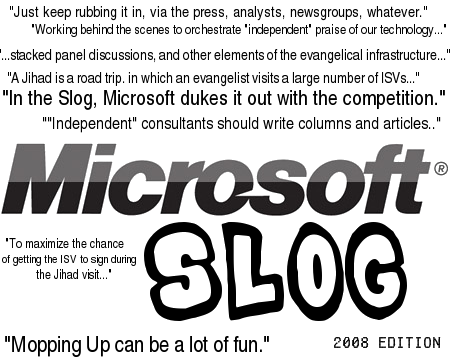 Therein you have many of the characteristic of what Microsoft refers to as "The Slog", which is beyond just “guerrilla marketing”. Looking at VMware for some details, Vance reveals the ugly story behind it. In the summer of 2007, Diane Greene was lauded as a business hero for leading VMware, a maker of business software, to the hottest stock debut since Google. But in the ensuing year, despite her popularity with employees and on Wall Street, her relationship with her directors, and especially VMware’s chairman, Joseph M. Tucci, grew increasingly chilly. On July 7, she found out just how cold it had become. After Ms. Greene made a special presentation to VMware’s board, Mr. Tucci, who heads VMware’s parent company, EMC, pulled her aside, according to people familiar with the events, who asked for anonymity because they were not authorized to discuss internal company decisions. Inviting Mendel Rosenblum, Ms. Greene’s husband and the co-founder of VMware, into the room, Mr. Tucci told Ms. Greene she was fired, effective immediately. And he said the board wanted Mr. Rosenblum, VMware’s chief scientist, to take her seat on the board. Mr. Rosenblum declined the offer. And VMware’s new chief executive, Paul Maritz, once a top executive at Microsoft, is fighting to articulate how VMware can evolve from a darling upstart to a mature player capable of maintaining its growth while facing off against some of the world’s technology heavyweights. Microsoft’s partner of the year is appointing Microsoft leadership instead. It’s all about EMC and it’s some kind of war over the future direction at VMware. Microsoft is trying to ‘pull a Netscape’ against it with zero-cost and bundling of technology. VMware indicated over a year ago that antitrust action would be considered, but what is VMware now? Under the regime of a Microsoft executive (Paul Maritz) and top Microsoft partner (Joseph Tucci), it seems to have become just a corpse of its former self and a ‘yes man’ to Microsoft. In essence, VMware has been ‘hijacked’ not by investors but by companies it enabled to gain power over it, notably EMC. The ‘older-generation’ employees of VMware dislike the new management, which mistreats and sacks the founders. Here is some more new evidence of the backlash. We’ve been told virtualization is the fastest evolving sector of the computing industry. But now, VMware is running on autopilot without its key scientists, and Microsoft hopes another delay won’t hurt it too much. Rosenblum’s colleague, executive vice president for R&D D. Richard Sarwal, resigned from VMware just last week to return to his former employer, Oracle. And The New York Times learned that Paul Chan, VMware’s VP for product development, already left the company last month without the company making a sound. Dow Jones wrote about this too. Over at The Inquirer, this partnerships parade of Microsoft gets another mention with the addition of AMD, a Novell ally. AMD HAS TEAMED up with Microsoft in a bid to jointly take a bigger slice of the server virtualisation market. The two companies are offering a joint model which combines the Opteron’s AMD-V and Windows Server 2008 Hyper-V to streamline virtualisation on a hardware and software level. It must not be forgotten just how close Novell is to Microsoft in that regard, working alongside its partners of the year at Citrix, which grabbed Xen away from Red Hat, Ubuntu and other GNU/Linux vendors. Here are some more new details. It’s important to remember that Novell relies on Microsoft’s mercy and hopes that Microsoft will let SUSE gain advantage over Red Hat through virtualisation. In fact, Ron Hovsepian’s coming talk will be focused primarily on some of these issues. Novell today announced Ron Hovsepian, president and CEO, will deliver a keynote at Interop New York on Wednesday, Sept. 17 at 10 a.m, at Jacob Javits Convention Center in New York City. The Interop New York conference is focused on providing comprehensive thought-leadership on key IT topics and the future of business technology. In line with those themes, the keynote, “Making IT Work As One,” will outline Novell’s solutions strategy, with a focus on delivering customer value by reducing cost, complexity and risk in today’s mixed IT environments. In order to erode VMware’s strong position even faster, Microsoft will be doing what it does best: dumping. Hyper-V is Microsoft’s entry into the crowded field of virtualization vendors where the hypervisor is looking more and more like a commodity. VMware is the dominant player, but Citrix, Oracle, Red Hat, Sun and Novell are among those offering virtualization technology. There is a lot of hyping up around Hyper-V at the moment. The Linux-hostile Sys-Con [1, 2] has just aired the article “The End of VMware!” Announcing a death prematurely to make it so? The editor stripped off the exclamation mark later, but the headline is still damaging. This smells like classic “Slog” tactics. Microsoft ‘talking point’ Ivy Lessner wrote another article indicating VMware despair. Interesting part about Vmware, I had not known any of that or failed to read about it earlier.. I wonder how Vmware will be regarding Linux in general in a few years. I was wondering how Maritz got in. Some big players (not necessarily just at Microsoft but maybe) decided closed-source VMWare did not stand a long-term chance without levers and anchors like Microsoft has. After convincing key EMC people also worried to death about FOSS (eg, Tucci), it was likely decided they would get (the equiv of) money to buy VMWare. The technology would be allowed to migrate over to Microsoft. They took it public in order to squeeze out remaining value in VMWare by dumping inflated shares on the public. Also, the VMWare brand will now likely be destroyed, and some people will get payed well. Most of the honest and hard-working, however, will likely be looking for jobs soon. Don’t mean to sound the end of VMWare, but this has probably been decided by actions already taken. That’s what it sounds like to me from what I have been reading on BN and elsewhere. Virtualisation turns from a product into a feature. But the solution here seems to favour the wrong company.